Hello, my name is Jacki Zehner. I am a former partner and Managing Director of Goldman Sachs, and I am now a full time philanthropist, investor, advisor, connector, and movement builder, almost all of which works towards my purpose in life of advancing women and girls. I have many formal roles and titles, as well as many informal ones. My primary title is that of Chief Engagement Officer and Board Member of Women Moving Millions. I am also a Board Member of the Sundance Institute, and chair their development committee. Recently, I have gone beyond merely funding social issue documentaries by moving into executive producing (Hot Girls Wanted, The Hunting Ground, 50/50). I am a wife to an amazing husband. I am a proud mother of two wonderful children and adorable two dogs. I am a friend, ally, confidant, mentor, mentee, and cheerleader to many, and because of all this, my to do list is often just shy of a mile long. So how do I do it all? Answer: the best that I can. One of the biggest refrains from the second and third wave feminist movements was the idea that women could do it all and have it all. We were entering the workforce at a critical mass, all while raising families and creating happy homes, and although this all sounds good in theory, more and more research is pointing to a far less euphoric truth. Women, whether they are married or single, mothers or childless, are increasingly facing so much pressure to be perfect in every aspect of their lives, that we are winding up burnt out, depressed, and riddled with feelings of guilt over not achieving this so called perfection. Now I can’t speak to anyone else’s experience, but I do know that I have often struggled with these feelings in my life. I have often wondered if I am being a good mother when I work so much, and I worry about work when I am with my family. However, over the years I have come to realize that it’s simply not possible for me to manage every single detail of every single aspect of my life, not to mention my family’s lives. I have learned the art of letting things go, albeit begrudgingly at times, and I’ve often wished that there was a how to manual to tell me exactly how to do that. Thankfully, that wish has now been granted. Tiffany Dufu is the Chief Leadership Officer for Levo, the fastest growing professional network for Millennials. Prior to this role she was a member of the launch team for the Lean In initiative and served as President of the White House Project, which is how I first got to know her. Tiffany has been a passionate activist for the advancement of women and girls for decades, and has balanced this quest with her family life raising two children with her husband in New York City. Tiffany is an incredible woman, who much like myself, was often asked how she managed to do it all. 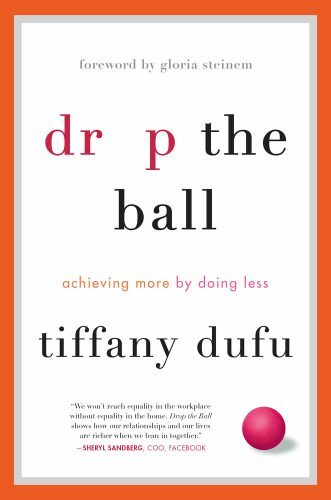 Well, she can now add published author to her resume, because TODAY marks the release of Drop the Ball: Achieving More By Doing Less, a memoir and manifesto of how she came to realize that the key to getting it all done was to let things go. After reading the book, I had some questions for Tiffany. 1) Tiffany, tell me about this book and why you chose to write it. In 2013, I was doing a lot of public speaking on women’s leadership. I would largely speak about collective solutions to getting more women into the highest levels – public policies like equal pay for equal work and affordable childcare or corporate practices like workplace flexibility and sponsorship programs. But I noticed that during the Q&A, the first question was always a personal one: “How do you manage it all?” I realized that women kept asking me this question because they were trying to figure out the answer for themselves. I saw that the overwhelm of their life-go-rounds, managing a full-time career outside the home while being the boss inside of it was stifling their career ambition. As someone whose life’s work is advancing women and girls, I felt I owed it to women to answer their question truthfully. This meant telling my own story. 2) In the book, you relate several conversations with friends and colleagues that had an impact on your life/career. Was there any one conversation in particular that made you decide to write this book? One of my dear friends and Peer Mentors is Reshma Saujani, the Founder and CEO of Girls Who Code. I had mentioned to Reshma that I was thinking about writing a book, and in an effort to hold me accountable she’d ask me about it every time I saw her. One time I got frustrated and told her that I had too much on my plate and that I just didn’t have time. She says to me, “Well I think that should be chapter one – why women don’t have any time.” I realized that Reshma wasn’t going to let it go. If our friendship was going to endure, I’d better write a book, otherwise I’d never hear the end of it! 3) Other than the main theme of dropping the ball and letting go, is there one particular piece of advice and/or anecdote that you hope readers take away from this book? That loving yourself as imperfect is the prerequisite for dropping the ball. Women are under enormous pressure to fulfill our roles and we put the word “good” in front of all of them. It’s not enough to be a daughter. We strive to be a good daughter, a good student, a good worker, a good wife, a good mother. Fulfilling all of these roles flawlessly is humanely impossible, but we still beat ourselves up trying. My hope is that women will separate our value as human beings from our performance of these roles so that we can free ourselves from the guilt. 4) Due to the fact that this is a memoir of your life and your experience as a woman, one could assume that it would be easier for women to relate to your story than men. With that in mind, what are your hopes for a male audience? What do you hope male readers take away from it? After my husband read the first draft of the manuscript, he came to me and goes, “Is this what’s been going on in our relationship? !” Drop the Ball is a good book for men because it demystifies a lot of interpersonal dynamics. Now that I’ve started touring, I’m also realizing that men have a lot to gain from the frameworks in the book about time management and prioritization. All of us can benefit from getting clear about what matters most to us and figuring out our highest and best use in achieving that. Last week I spoke at Google, and a gentleman approached me to sign a book. He had referenced his wife during the Q&A so I asked him what her name was so I could sign the book to her. “My wife? ?” he says, “Oh no – I’m the one who needs to drop the ball! !” I hope that men who read the book are inspired to drop their own ball: the unrealistic expectation that they should strive to be breadwinners at all costs, even at the cost of spending time with their families and supporting the women in their lives. The world has a lot to gain from men’s talent and ingenuity at home. 5) You cite some shocking statistics about how Millennial women believe they are failing as mothers. Whenever you meet a young mother and hear her express this sentiment, besides handing her a copy of this book, what’s the first thing you say to her? #1 You’re not alone. #2 When our children grow up, they’ll have the right to tell their own stories about their childhood. Those stories won’t have anything to do with how well we’ve performed our job as parents. So don’t worry yourself trying to influence that. Focus your energy on just trying to be the kind of person you’d want your children to be. They’re watching us. 6) Does it ever get wearying having to answer the question, “How do you do it all?” Or do you always relish the opportunity to educate people on how to Drop the Ball? I used to be annoyed by this question because I thought it was a personal one and I didn’t understand why people were so interested in my personal life. Now I understand that the personal is collective. A woman figuring out how to get everyone out of the house at the right time with the right backpack is a revolutionary act. 7) What is your hope for the Drop the Ball movement going forward? We are living in an intense and volatile time. We need women’s leadership now more than ever. I hope that Drop the Ball will free and inspire more women to occupy the highest levels of power and influence in this country. I can attest that Drop the Ball is a heartfelt, timely, and important book, and I encourage everyone to get their copies today. Now more than ever, we need everyone, men and women, to be working towards their best possible selves. If you need to Drop the Ball to get there, I say go for it.